I’d been suffering with wrist, elbow and neck pain for about a year-and-a-half. I’d seen various sports medicine doctors and physiotherapists, but, unfortunately, without any luck in pain management. Dr. Notley introduced himself via Twitter, after I made a comment about wrist pain I was experiencing. The day after my first appointment, I already felt 30% improvement in my wrist and I had full range of motion in my neck. After only a couple of months of first weekly and then bi-weekly treatment, I feel better and more pain-free than I have before! Dr. Notley is a very professional, friendly and down-to-earth individual. I appreciate that he really took the time to sit with me at my first appointment to see what would be the best course of treatment for me. I had a referral for acupuncture, but turns out A.R.T. (Active Release Techniques) is what was best for my body. Dr. Notley’s level of experience is definitely what sets him apart in the field and I’d recommend him to anyone seeking relief from pain! P.S. Cindy gave me permission to post her email and give her twitter name. I would like to share with you a testimonial by one of my clients. She sent this email to me this past week. Lindsey is a very impressive athlete and Firefighter. Check out her accomplishments for 2011. Note that she has competed in a variety of fitness challenges. I’ve been getting treated by Dr. Notley for a couple of years now. With the number of sports I do, not to mention my job, I need to be ready to go at all times. Dr. Notley makes sure that I am. I had knee surgery in 2010 and I’ve come back to have a breakthrough competitive season. Dr. Notley has been an integral part of my success. Lindsey trains people out of CrossFit 204. If you are looking for someone to train you check out the website. As a chiropractor I meet a number of amazing people. They come to see me for various reasons. Some come because they were injured from a car accident, injured at work, or they have been injured pursing their fitness goals. Lorrainne is one of these amazing people. Lorrainne, is a competitive bodybuilder and she came in to see me for an injured shoulder several weeks before her first competition. what makes her amazing is how much she had changed her body in the matter of six years. 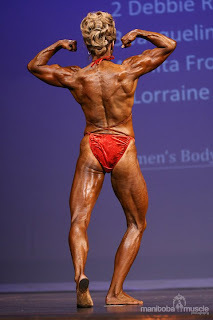 You see, Lorrainne didn’t start her bodybuilding career as someone who was already in shape. Standing at only 5 foot 4, Lorrainne was 218 pounds in 2006. Now, she weighs in at 137 pounds. Check out her story in the Winnipeg free press. Not only was this her first competition, but she won her weight class and the master’s division! Lorrainne recently dropped me a message at DrNotley.com ‘s Facebook Fanpage thanking me for helping her as she prepared for her competition. Congratulations Lorrainne on your wins and I hope you have more successful competitions in your future. Winnipeg’s only fuel credentialed chiropractor and athletic therapist in Winnipeg. I just wanted to drop you a note to say that I believe my foot is finally 100 per cent. The last little bit of stiffness has abated in recent weeks and it feels pretty darn good. Which is why I haven’t been back after my last appointment in early December. Thank you for introducing me to a new kind of treatment – it’s always important to have options when dealing with sports injuries. After months and months of lingering pain and stiffness, ART (Active Release Techniques) was one of the most, if not the most, impressive therapy treatments I have ever tried. My friend (who you also treated for a foot injury) was equally pleased with her quick progress. I expect you will see more of me and my teammates in the future, though hopefully not too much! Wishing you continuing success in your therapy business. Thank you R.H. for your kind words. I do my best to provide the most appropriate treatment for my Chiropractic patients. Like I tell all my patients, “If my treatment is not showing an improvement we need to re-examine our approach or we may need to refer out to the appropriate health care provider”. With the appropriate treatment results should be seen. Winnipeg’s only dual credentialed Chiropractor and Athletic Therapist. I recently had a patient post on my Facebook Fan Page this testimonial and I thought I would share it with you. “When I walked into your office Chris, I wasn’t completely sure that adjusting me or acupuncture would work to relieve my pain. Thank God I was wrong. I can honestly say I am pain-free and that is something I truly never thought could happen because I hurt in so many places. Those little needles and the trust I had in you Chris, as a chiropractor and a friend, have changed my life. I thought I would be on disability forever but now I see a new future for me…going back to work, maybe even playing my favorite sport, disc golf. I cannot begin to thank you…you will never know how much you have affected my life. Thank you Dr Notley, thank you my friend! As ‘Butter’ would say ‘Life is good!’ “- Karen, Winnipeg. I always appreciate getting responses like this.